"I was devastated when the stick said pregnant." Panic, fear, doubt and worry - emotions that will ring true with many women when they find out they're having a baby. Especially, but not exclusively, if the pregnancy is unplanned. But to share those feelings publicly? Few do so. We live in a world of social media filters where everyone seems to present the very best version of their lives. 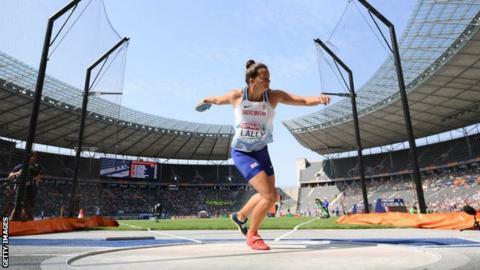 Jade Lally is an elite discus thrower, an Olympian no less. So she's got it all figured out, right? Due to high-profile sportswomen like Serena Williams, Jessica Ennis-Hill and Laura Kenny, we now know more about the physical impact pregnancy and motherhood has on the body. But what we hear less about is the mental warfare: the loss of identity; financial pressure; juggling motherhood with a career. As an athlete, Lally is by her own admission "selfish". But with her first child due in August, soon she won't be able to put herself first. She's 32 and has no sponsor, no funding, and her partner is currently living in Australia. The Commonwealth bronze medallist has chosen to make her pregnancy public in this interview, in which she speaks candidly about her struggle to accept that her life, priorities and body are changing. "I am scared of losing my identity, because most people know me as a discus thrower." Lally has been representing Great Britain since 2006, and made her Olympic debut 10 years later in Rio. With the Tokyo 2020 countdown well under way, a baby was not on the agenda. "I was in no man's land, I was pregnant but it threw me," she says. "I had many, many questions from an athlete's perspective, from a female perspective and a professional perspective. "Pregnancy is hard for me, it's super uncomfortable for me, but I did decide to do this and to keep the baby." Lally's body is changing, and will continue to do so for a few months yet. For someone whose body is their work tool, that's tough to come to terms with. "It's a daily struggle. Every week so far, I've found something that I now can't do, and that is really difficult," she says. "Now I physically can't throw, and I've never been in that position before. My groin is sore, my back is sore, there are things that are sore that have never been sore before. "I knew my performance was going to fall off, I knew there were going to be things I wouldn't be able to do, but actually going through that is harder than I anticipated. "I'm not a vain person, but I have worked hard for a really long time to have my body perform the way it does and I'm fairly proud of how it looks." "I am not sure what this little human is going to cost, and that is scary." In recent years, we have seen athletes like tennis great Williams return to the top of their respective sports after giving birth. Lally has not been funded since 2017. She already feared British Athletics has written her off due to her age, never mind her pregnancy. Her boyfriend - an Australian soldier who will move to the UK before their daughter's birth - will be unable to work because of his visa, so finances are going to be tight. "Looking at our financial situation, I only ever earn enough to support my career. I pick up odd bits of personal training work as extra, but I do them as I need to do them, for example ahead of a training camp," she says. "It's daunting that we are not really going to have an income. But there are people worse off, and I am choosing to do this." Lally openly admits her baby was not planned. She wasn't entirely sure she could conceive due to past health issues, but she hoped there was still time. "When you are going to start a family is a hot topic," she says. "You're aware of your biological clock, and you're aware that friends are on baby number two or three and you're still there trying to make your little PE lesson a dream and a career. "I always pictured myself as a mum at some point. I didn't actually like the thought of being pregnant, but that was something I was going to have to deal with. "I don't want my child to feel that she is coming second to anything, I will have to learn to juggle putting her needs alongside mine as an athlete. "Hopefully she will know we are being selfish for good reasons, we're doing this for our careers while also being the best parents we can possibly be." Having qualified but not been selected for the London 2012 Olympics, Lally did make her Games debut at Rio 2016 but "crumbled" when it mattered most. As far as the Olympics are concerned, she has unfinished business. When her daughter arrives, she will have exactly 12 months until the Tokyo Olympics get under way. A "daunting" challenge, maybe, but Lally acknowledges next year's Games are not the be-all and end-all. "If my body isn't the same and I can't get to Tokyo, I now want to go to the next Games in Paris. I'll be 37, but I will have a four-year-old at that point and that surely will be easier than the first year," she says. "If it doesn't go to plan, I've got Paris. Paris will be the one. I've already moved the stepping stone, if only for my mental happiness." Lally admits she briefly considered terminating the pregnancy but, having weighed up her options, came to only one conclusion. "Would I regret more trying to get the Olympics and terminating this pregnancy, and then potentially missing the Olympics, leaving me with neither, or be happier with trying to reach Tokyo and having the baby, and failing?" she says. "If I fail and never go to an Olympics again, I've got a baby girl and I will be happy with that." For information on how to find mental health support, visit the BBC advice pages.